❀❀ Cotton Polyester Lace Blending. ❀❀ Size Table means age ranges for girl, but they are for general guidance only. For most accurate fit, we recommend checking detailed measurement before purchase. ❀❀ Both gently hand wash and dry-clean are recommended. Use mild detergent and hang dry, but do not bleach, and use hot water. 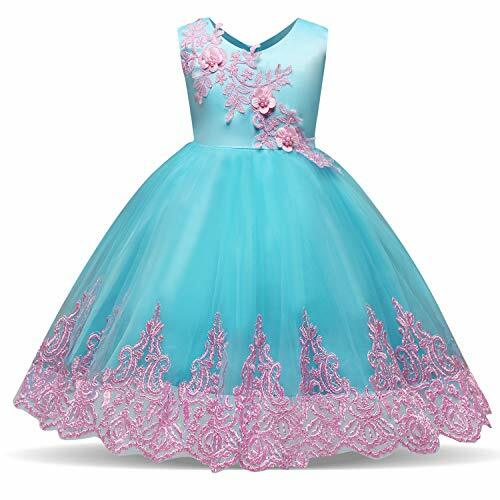 ❀❀ This princess party dress suitable for some special occasion like birthday party, wedding party, holiday party, Easter, children's day, theme party, ceremony, kindergarten graduation, ceremony, performance, stage performance, dance show, graduation ceremony, photo shoot, family gathering, banquet, formal event etc. ❀❀ Round neck and sleeveless girl dress. 3 piece of small 3D flower embroidered in the bodice. A large double-layered bow in back make the dress more elegant. Dedicate embroidered tulle hem, unique and fashion, make your girl be a graceful princess.